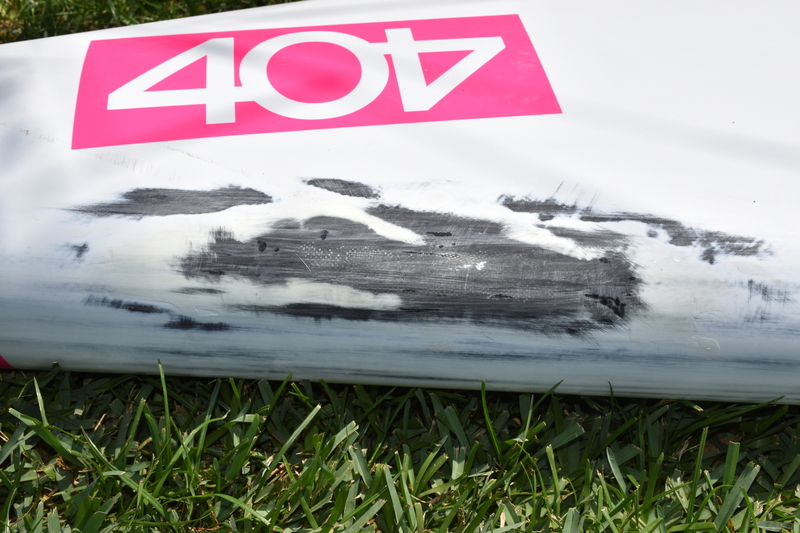 404 Carbon Race V3 Paddleboard: How I repaired cracks in the carbon fiber layer. 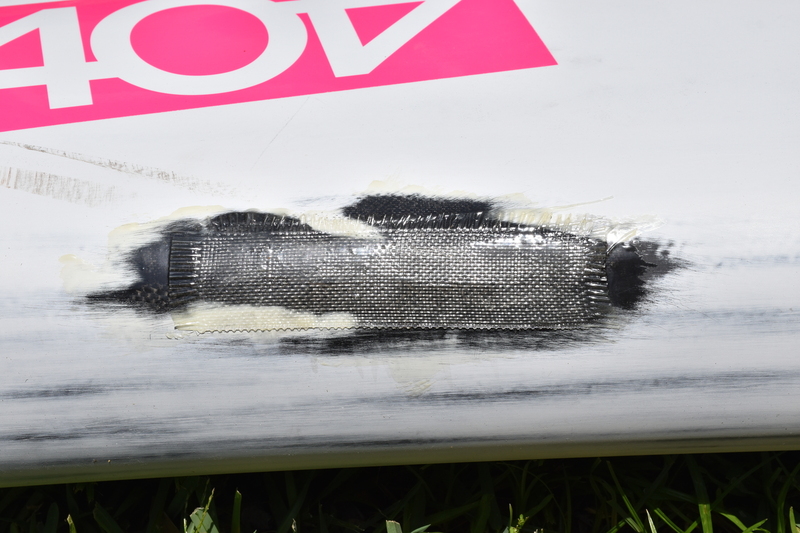 My first weekend outing with a new 404 Carbon Race V3 paddleboard ended in disaster when I discovered two relatively large cracks prior to heading out for the second day Alexander Springs paddleboarding trip. 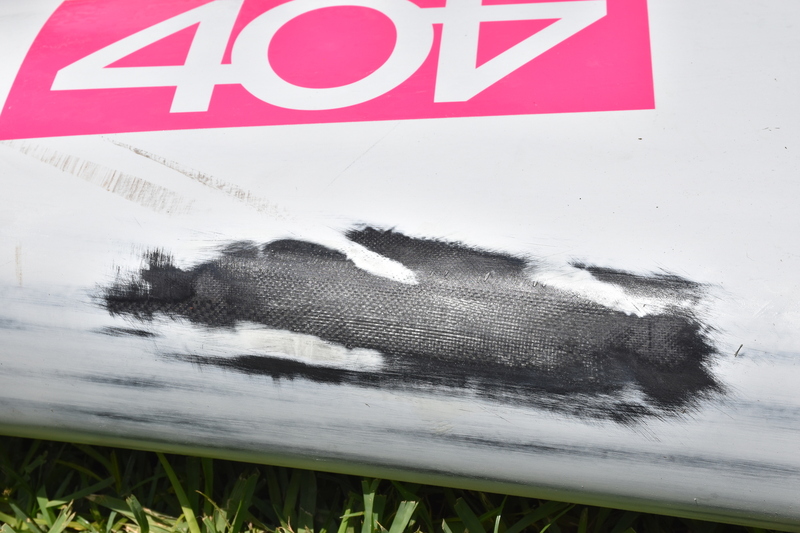 My first reaction was that the board might be trashed beyond repair but realized that the cracks could be fixed after I settled down a bit. It hadn't taken on water which would have been the worst case scenario. 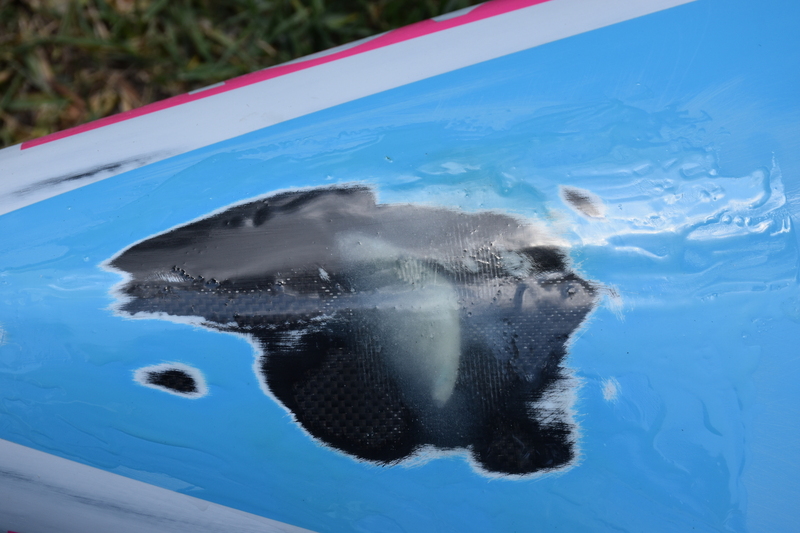 When the trip was over I researched techniques to fix carbon paddleboards with similar damage. 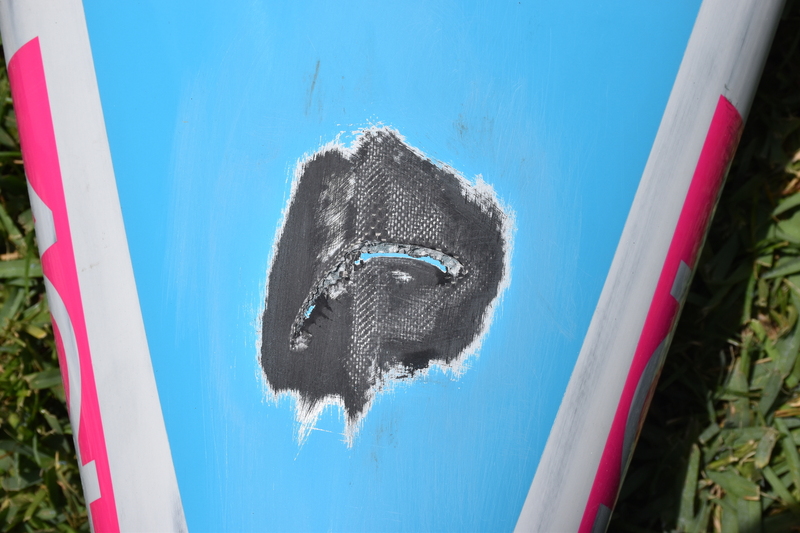 I also thought I could have the it fixed by someone else but thought I might like to actually fix the paddleboard myself and that is what I decided to do. 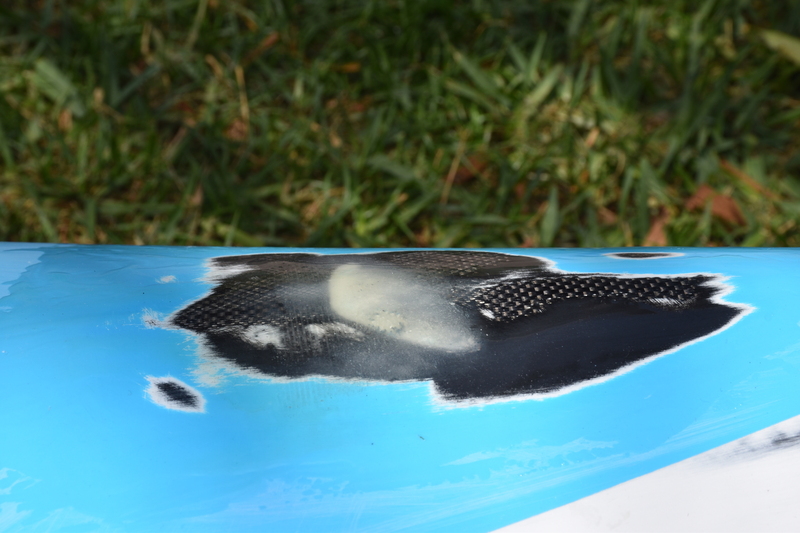 You might wonder what happened to the paddleboard. What would cause two cracks in different areas - I did too. 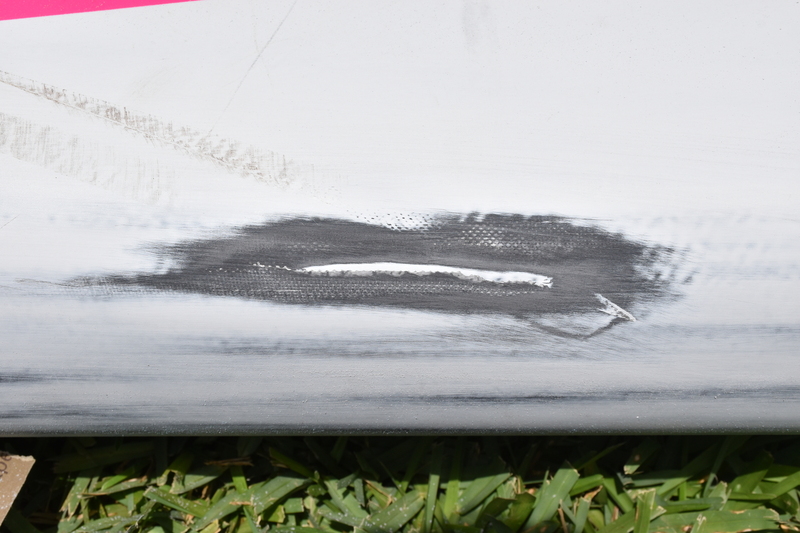 Lets just say it isn't a great idea to let anyone take your board from the water and rack it even if it is family. 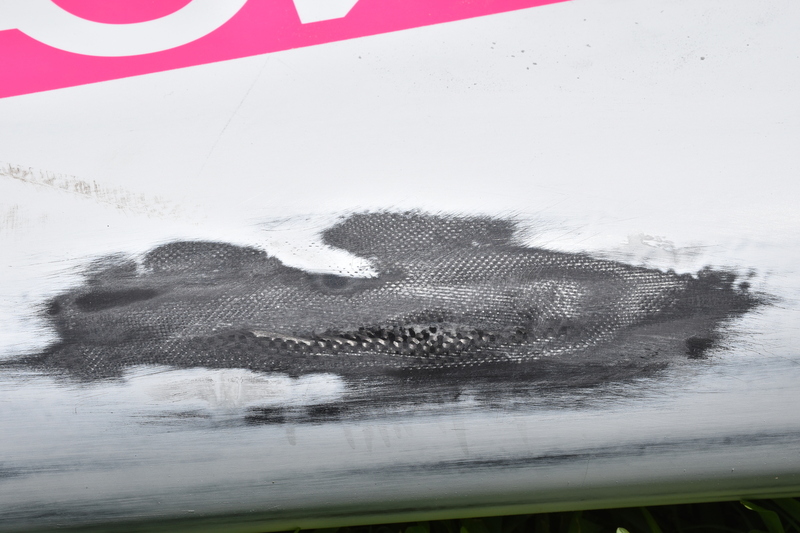 Race boards are thin skinned and easily damaged. Lesson learned! The repair consisted of four distinct phases. I call this part one where part two will cover the final paint / clear coat procedures. After searching for the best kits which had all the necessary items to do a full repair, I decided to use West Systems 101-6 Maxi Repair Kit which can be bought in many places online. I bought the kit locally at West Marine to avoid lead times and shipping costs. The kit has everything you need for a complete repair of multiple damaged locations. It worked out nicely for the two areas I needed to repair with spare items for any additional projects. One decision I struggled with a bit was whether to use a carbon fiber based kit or a fiberglass based one. The only carbon fiber kits I found incomplete in the sense that none of the kits had everything needed for the repairs. I decided to go with a fiberglass kit simply for this reason knowing I could always redo the repair with carbon fiber kit later. You will need to buy sandpaper in any case. IMPORTANT NOTE: The linked West Systems kit doesn't not list the fiberglass cloth - kinda important - and I am not sure why the kit I bought provided it. Had the kit not included the fiberglass cloth, I probably would have bought another kit. 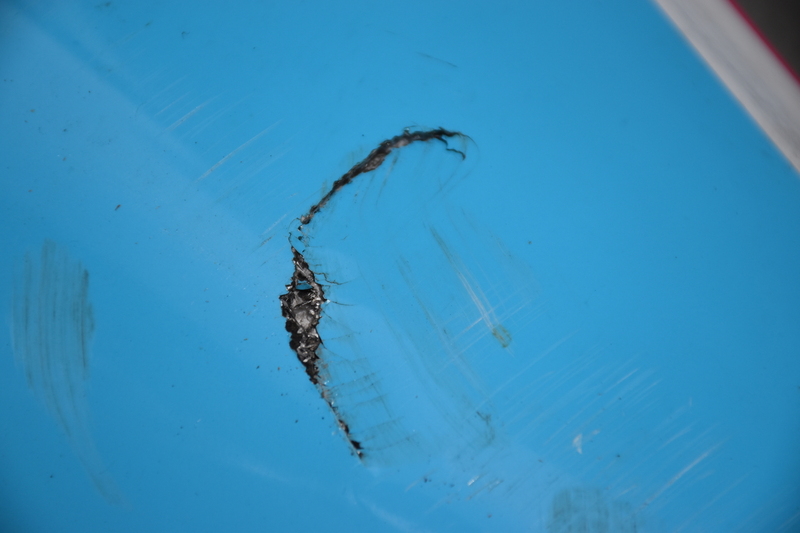 The top crack was more of a large puncture about 1.5" in diameter. 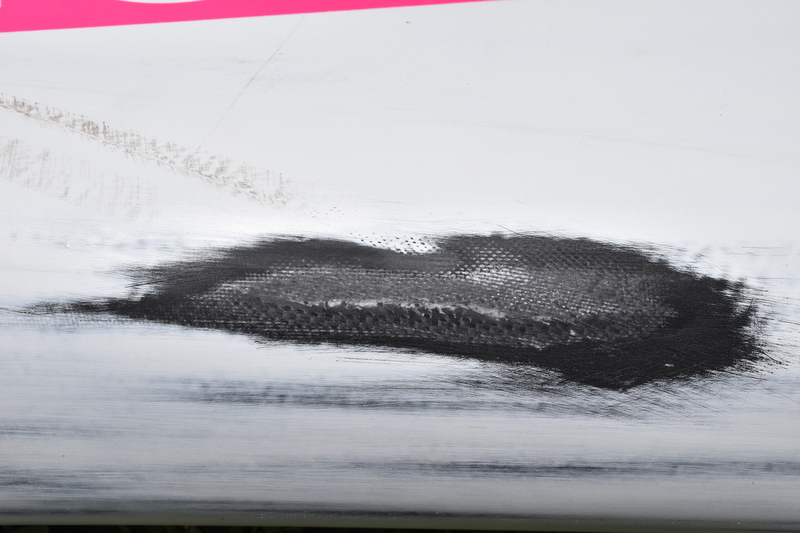 You can see it breached the carbon layer. A closeup photo of the top crack. The side crack. This photo shows the crack better. 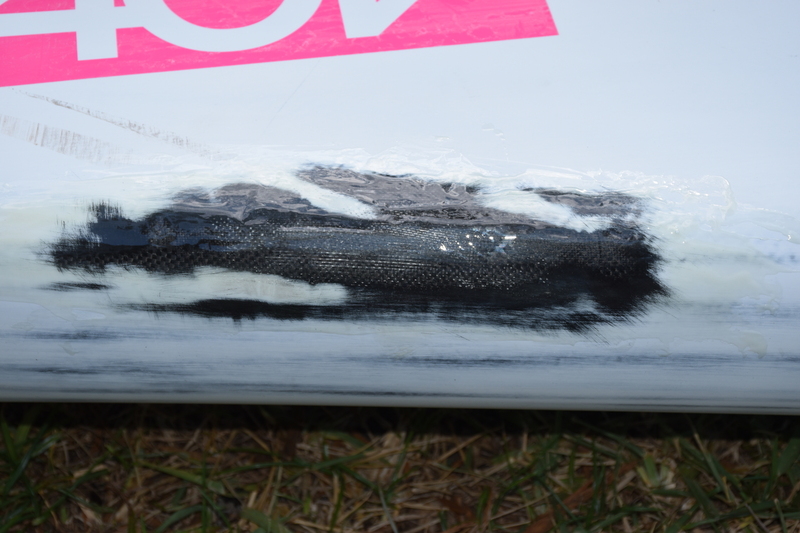 It also breached the carbon layer. Given that the cracks were slightly different I handled each accordingly. 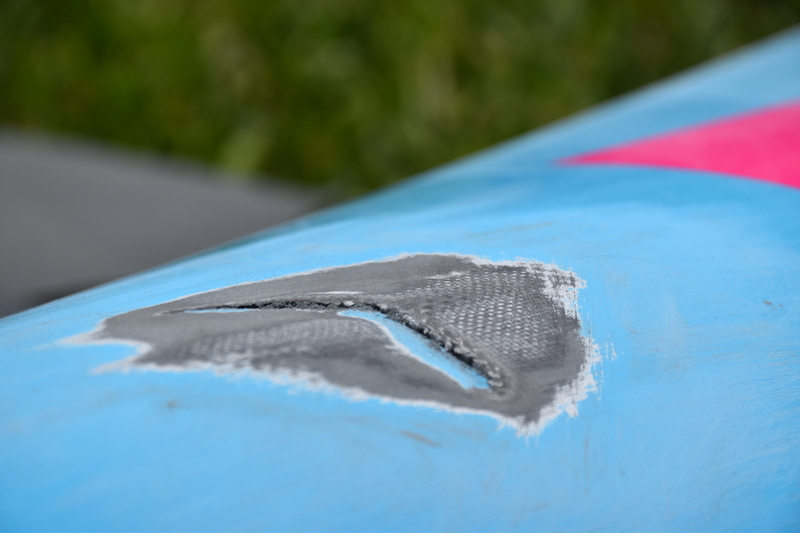 Start by thoroughly sanding the damaged areas followed by an epoxy / fiberglass filler / fiberglass cloth step. 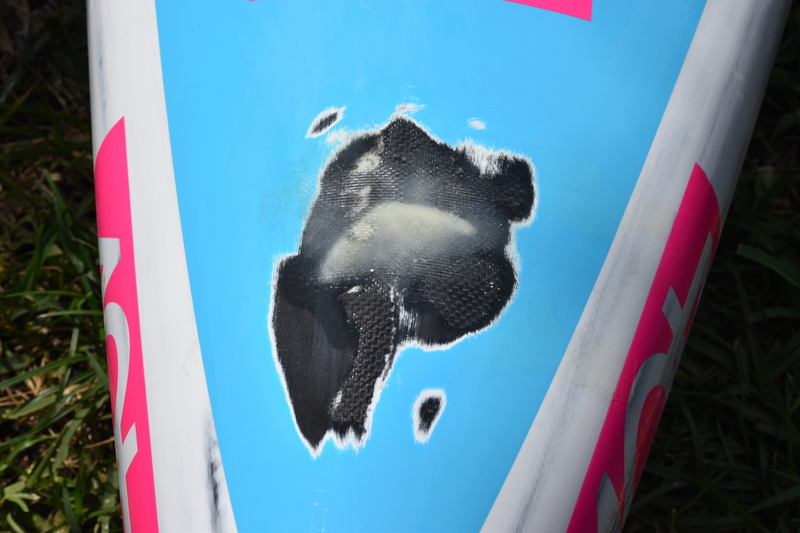 The top crack was slightly more pronounced so I embedded fiberglass cloth in addition to epoxy / fiberglass filler. 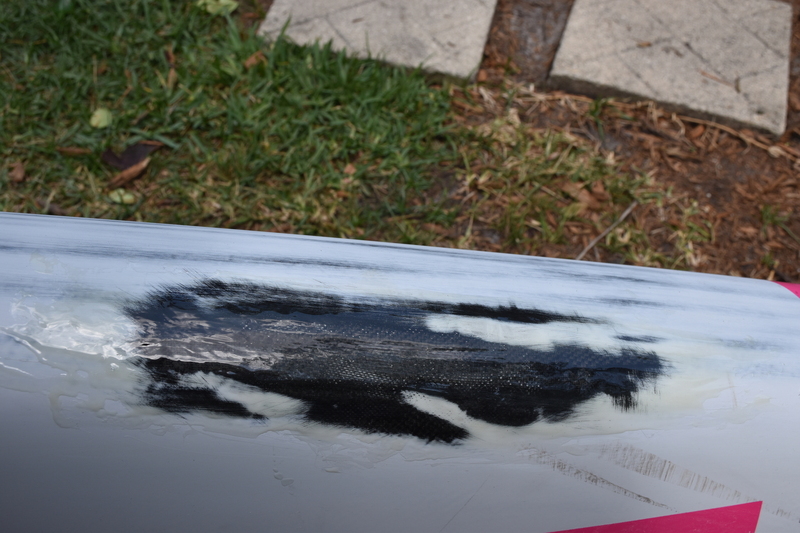 The side crack was a cleaner crack but used epoxy / fiberglass filler just to fill any 'micro voids'. Start with sanding using the 80 and 120 grit sandpaper. I couldn't sand all the paint out of the crack and didn't want to cut away any the carbon material as there is no real support underneath. 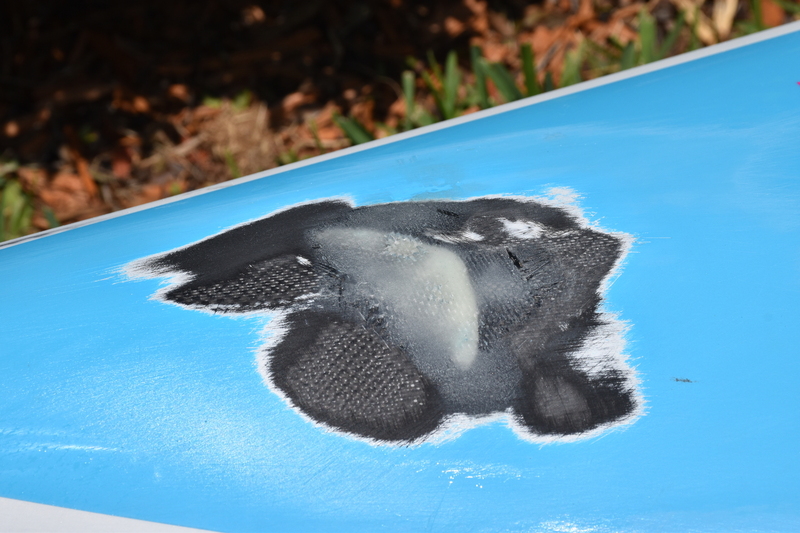 It was also very weak and I could easily damage the board further if I continued sanding that area. I left it like this which was good enough for this phase. 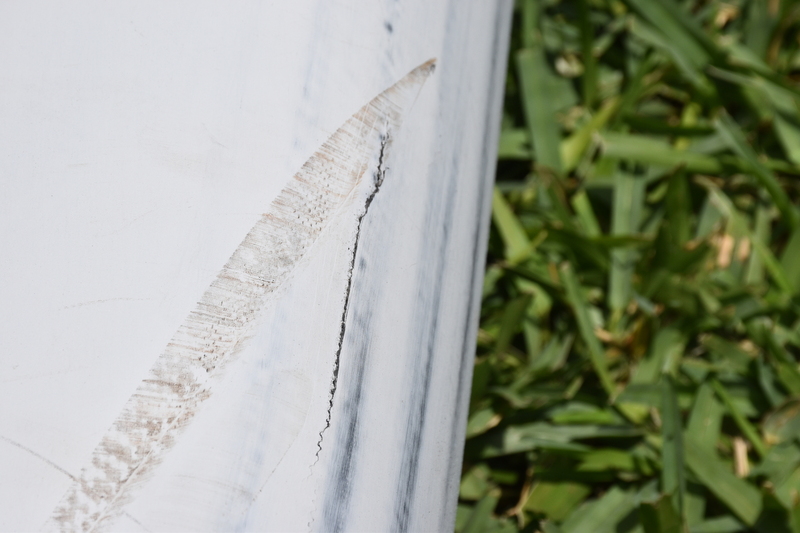 The side view shows just how bad the 'puncture' was and reason enough for me use a fiberglass filler embedded with fiberglass cloth. Spread a base layer of epoxy resin using a provided brush. Mix the high density fiberglass filler with the leftover epoxy resin and use this to fill in the gap. Embed fiberglass cloth into the high density fiberglass filler. 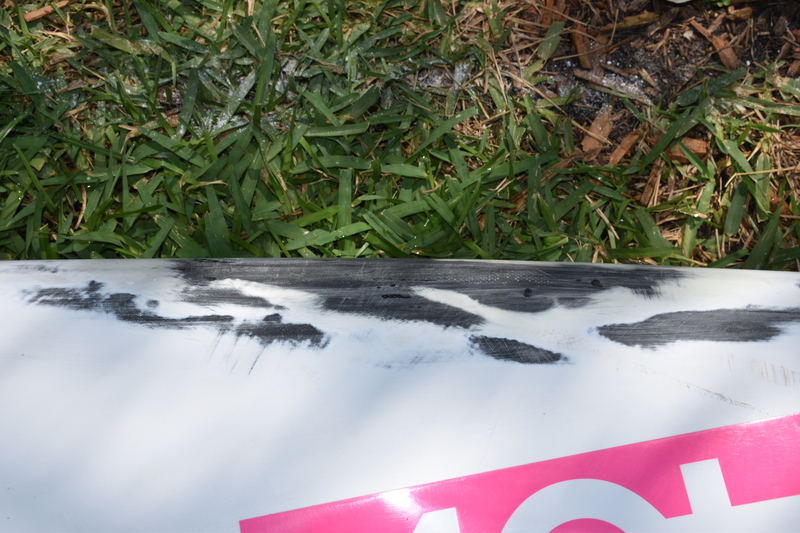 When embedded or using fiberglass cloth be sure to brush another layer of epoxy resin smoothing out the fiberglass cloth as much as possible It may not have been necessary to do this step but it seemed like the thing to do. I wasn't concerned with the sloppy edges as it would be cut away prior to phase two sanding. Another angle for your convenience. On to the side crack. Sand until the paint and any rough edges are removed. The leftover paint here shows the bottom section was slightly depressed. Sand a little more to remove the remaining paint and prep the small indention on the right side a little better. As with the top crack, brush on a base layer of epoxy resin, and use the high density fiberglass filler to fill in any depressions. I did not use fiberglass cloth for this phase. Make sure to brush the epoxy resin on both cracks prior to mixing in the high density fiberglass filler so you don't have to do two mixes using two cups. 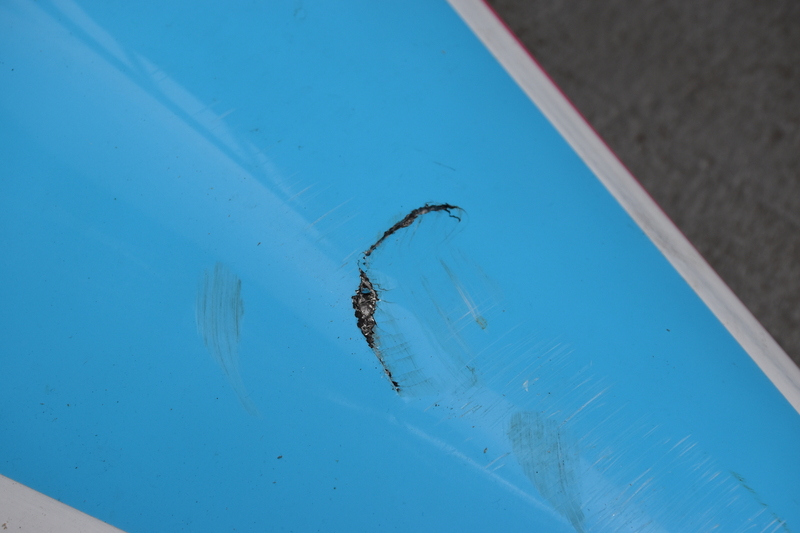 The provided epoxy and hardener packs were enough to handle both cracks. Another angle. Again - I wasn't concerned with being neat here as everything will be sanded in phase two. Cut the fiberglass cloth rough edges away leaving only enough to help fill in the crack depression then sand thoroughly with the 80 and 120 grit sandpaper. 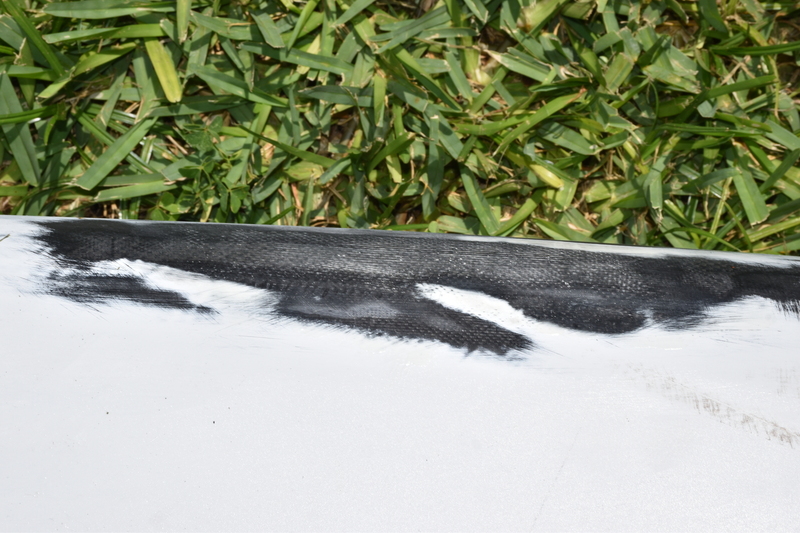 Apply a base epoxy resin layer then another fiberglass cloth layer that covers the crack and surrounding area more thoroughly being sure that this layer goes beyond the crack boundaries. 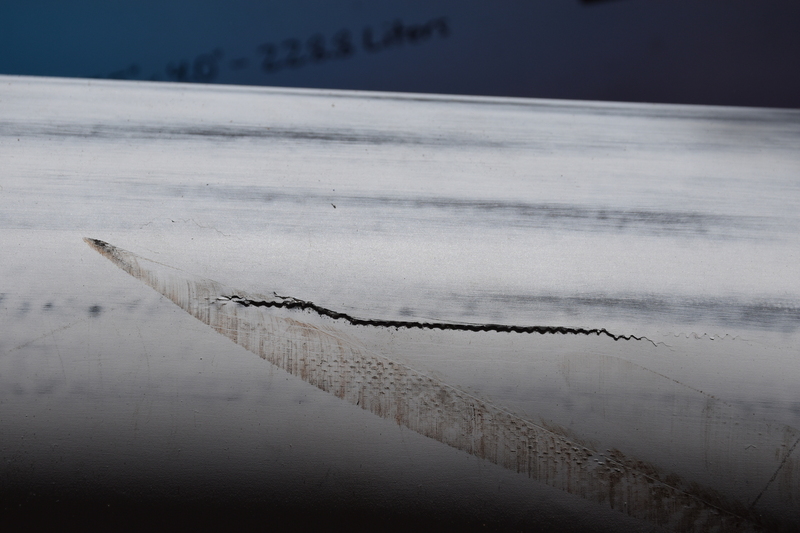 You want the fiberglass cloth to add support to the crack boundaries. 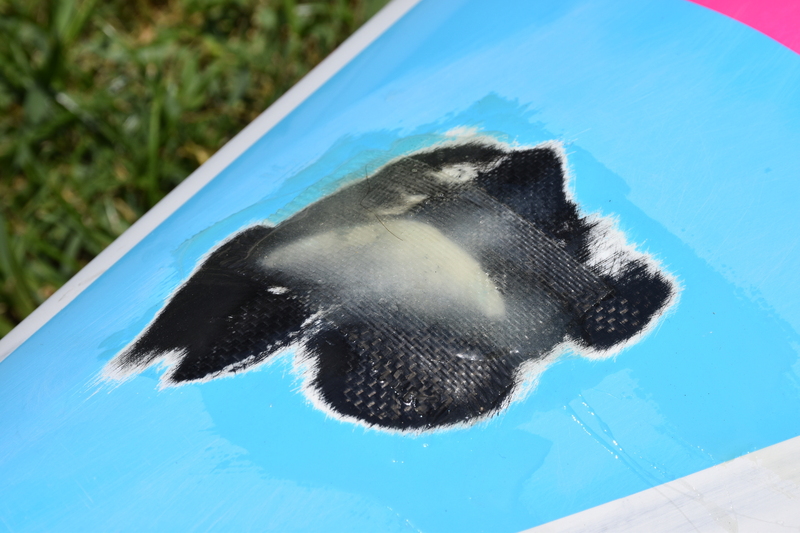 Again, brush the fiberglass layer with an epoxy resin layer which will smooth out and wrinkles. You want the fiberglass cloth as flat as possible. A better view showing the fiberclass cloth coverage. Sand the side removing any excess fiberglass filler from phase one. I also feathered out the area by removing more paint. The goal here is to mitigate as much bulge as possible prepping for phase three and four. I wanted the repaired cracks to be almost undetectable. Brush on an epoxy resin layer and lay on fiberglass cloth for strength. Cover the crack making sure it goes beyond the crack boundaries. You want to mitigate widening of the crack. I spent a little more time sanding as I prepped for the final phase. Again using 80 and 120 grit sandpaper. A concern was that I did not want a hump in the area. So far, so good. A close up view of view. Use a provided mixing stick to spread a layer of epoxy resin. A brush would have been better but the kit only has two. The mixing stick work fine here since phase 4 sanding will take care of any excess. I didn't add fiberglass cloth as enough was added during phase one and two. From this view you can see things are shaping up well for the top crack. The side crack is shaping up well too. I like how smooth this sanding phase is evening things out. Nice and smooth! As with the top, the final epoxy resin coat was all it needed. Just apply a single, thin layer. Another view of the final epoxy resin layer. The top crack final sanding went well. For this sanding phase I use very little 80 grit. Then I used 120,220, and 1220 grit sandpaper for the top and bottom. I also wet sanded some. Hopefully you notice no 'hump'. This is one of the goals. Looking good! And ready for paint / clear coat. Side crack repaired too. It was a good day! The repair didn't create much of a bulge if any. Overall I think the repairs went well and will be watertight. Before I paint, which will be covered in part two, I will test the effectiveness of the repair by pressuring the board and testing for leaks. 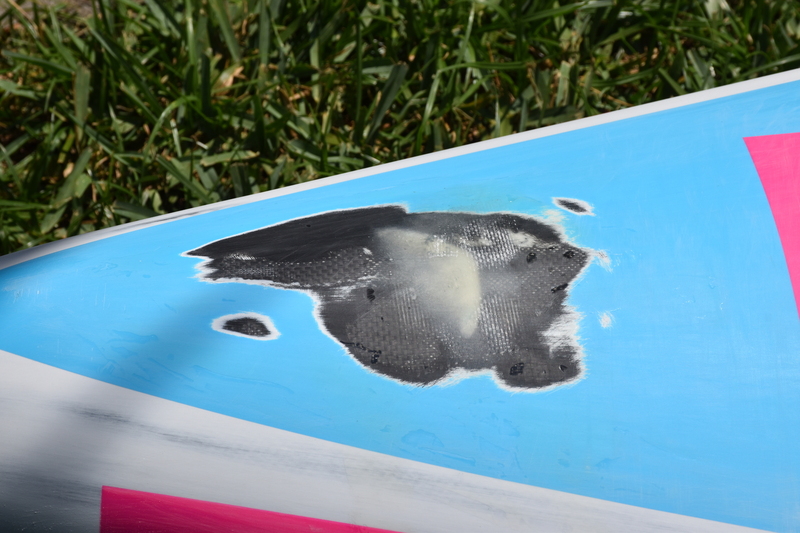 I don't want another board destroyed by water! 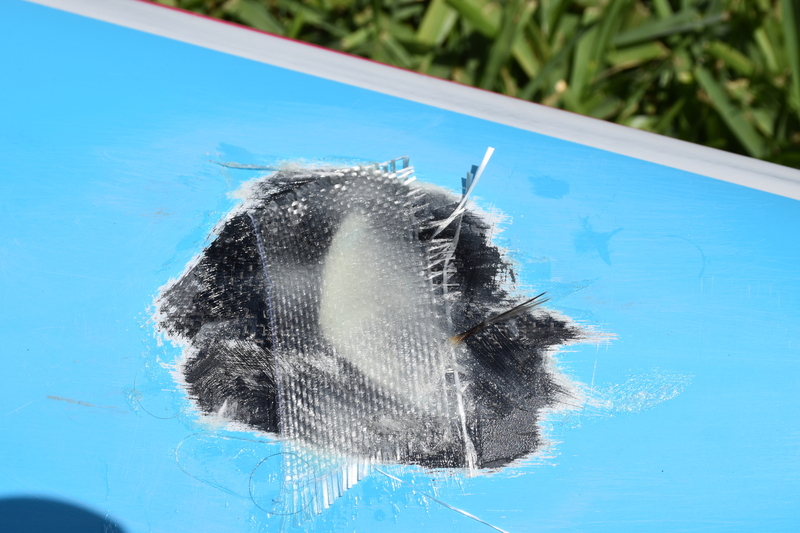 If you ever damage your board and it needs a repair, I hope you use this information to DIY. I enjoyed the process and appreciate what I learned. And seriously, I felt like I dodged a future bullet by now understanding how to handle cracks in vitro. 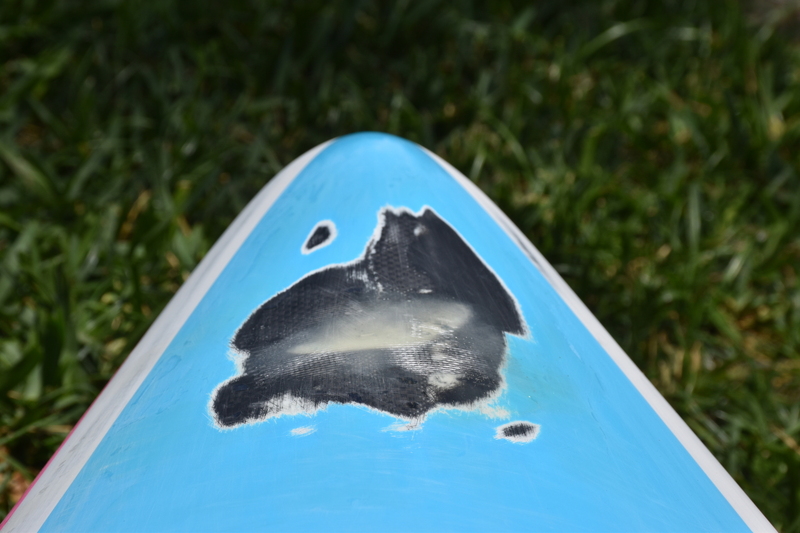 I would use other products but this process made me very aware of how easily a paddleboard can be damaged and that it would be wise to have something on hand to fix a problem when I am out on the water. 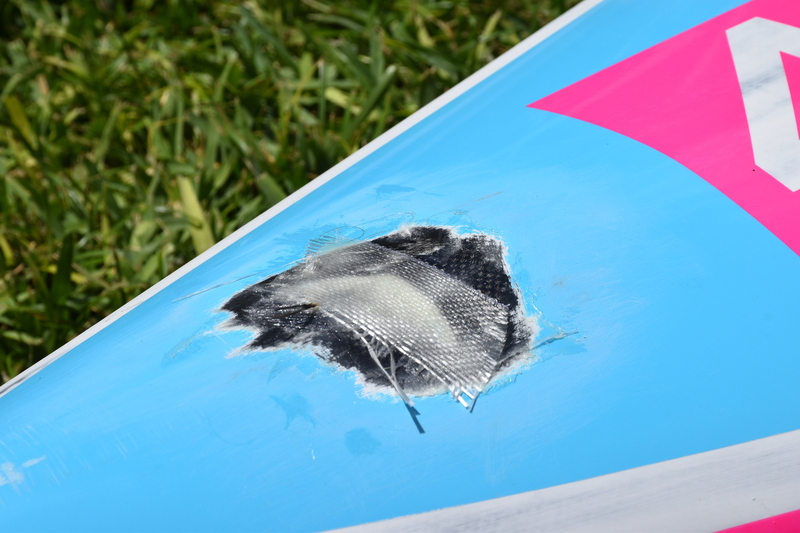 One thing I may have done differently is use a carbon fiber cloth vs. fiberglass but it isn't needed. It would serve only to keep the materials the same and that is only for my OCDish mind. 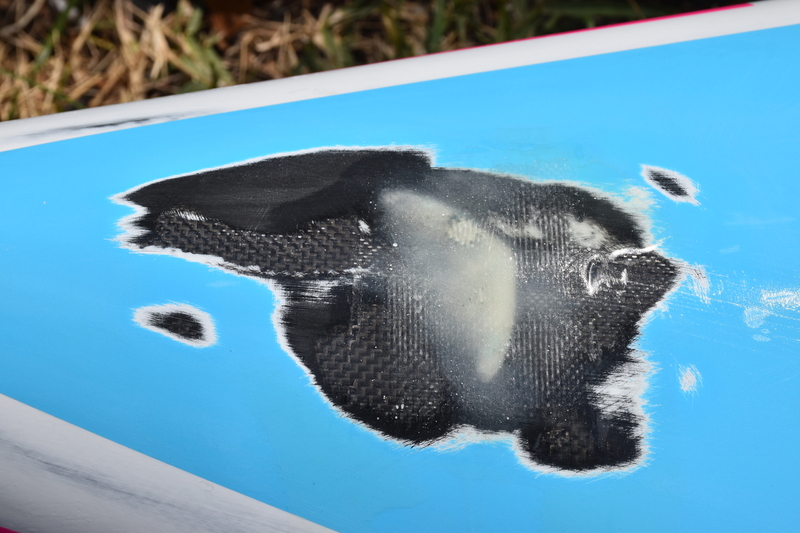 If you need more info, watch this video of a carbon surfboard repair that had been run over by a car.